Knife in hand, Domitila Reyes deftly cuts open the leaves covering the cob of corn, which she carefully removes from the plant – a process she carries out over and over all morning long, standing in the middle of a sea of corn, a staple in the diet of El Salvador. Reyes is taking part in the “tapisca” – derived from “pixca” in the Nahat indigenous tongue, which means harvesting the field-dried corn. The process will end, weeks later, with the selection of the best quality seeds, in order to ensure food sovereignty and security for poor peasant farmers in this Central American country of 6.3 million people. Some 614,000 Salvadorans are farmers, and 244,000 of them grow corn or beans on small farms averaging 2.5 hectares in size, the Ministry of Agriculture and Stockbreeding reports. In rural areas, 43 percent of households are poor, compared to 29.9 percent in urban areas, according to the latest annual survey by the Ministry of Economy. “I see that the harvest is good, even though the rain was causing problems,” Reyes, 25, told IPS. She earns 10 dollars a day “tapiscando” or harvesting corn. 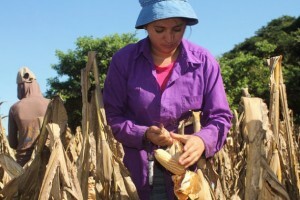 But Reyes, covered head to toe to protect herself from the sun in jeans, a long-sleeved blouse and a hat, is relieved that the high-quality or “improved” seeds have managed to resist the effects of the changing climate. “This corn has withstood it better…the rain hurt it but not very much. Other seeds wouldn’t have survived the blow,” she told IPS in the middle of the cornfield. Reyes is one of the nearly two dozen workers who, under the burning sun, are harvesting corn on this seven-hectare field, one of several that belong to the Mangrove Association in Ciudad Romero, a rural settlement in the municipality of Jiquilisco in the eastern department of Usulután. The region is known as Bajo Lempa, named after the river that crosses El Salvador from the north, before running into the Pacific Ocean. In that region there are 86 communities, with a total population of 23,000 people. Many of the inhabitants are former guerrilla fighters of the Farabundo Marti National Liberation Front (FMLN), which fought the country’s right-wing governments in the 1980-1992 armed conflict that left a death toll of around 75,000, mainly civilians. The Mangrove Association is one of the two producers of open-pollinated (the opposite of hybrid) native seeds in El Salvador. The other is the Nancuchiname Cooperative, also in the Bajo Lempa region. They sell their annual output of 500,000 kilos of seeds to the government for distribution to 400,000 small farmers, as part of the Family Agriculture Plan (PAF). Each farmer receives 10 kg of seeds of corn and beans, as well as fertiliser. “One achievement by our organisation is that the government has accepted us as a supplier of native seeds to the PAF,” said Juan Luna, coordinator of the Mangrove Association’s Agriculture Programme. Luna told IPS that with these seeds, Salvadoran small farmers are better prepared to confront the effects of climate change and ensure food security and sovereignty. In this country, 12.4 percent of the population – around 700,000 people – are undernourished, according to the United Nations Food and Agriculture Organisation (FAO). The Mangrove Association and another three cooperatives in the area produce 40 percent of the improved seeds purchased by the PAF, whether native or the H59 hybrid variety developed by the government’s Enrique Álvarez Córdova National Centre for Agricultural and Forest Technology (CENTA). The rest are produced by cooperatives in other regions of the country. “The seeds produced by CENTA are high quality genetic material adapted to growing everywhere from sea level to 700 metres altitude,” FAO resident coordinator in El Salvador, Alan González, told IPS. He added that the effort to promote this kind of seeds as a tool to weather the effects of climate change and strengthen food security and sovereignty are part of the Hunger Free Mesoamerica programme launched by FAO in 2014 in Central America, Colombia and the Dominican Republic. 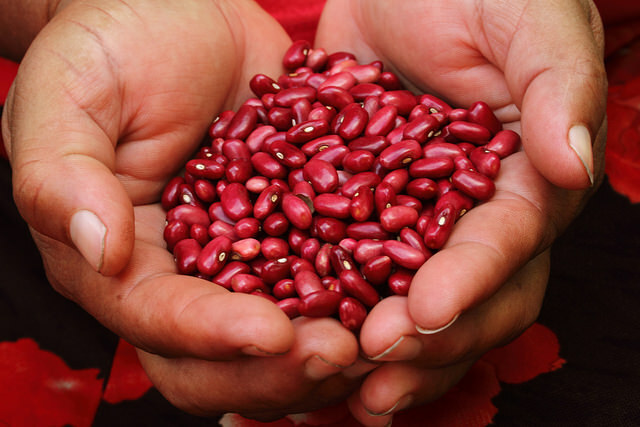 “High quality seeds are strategic for the country, because they make it possible for farming families to grow their crops in periods of national and global crisis, given the problem of climate change,” said González. Up to 2009, PAF purchased seeds from only five companies. But that year the FMLN, which became a political party after the 1992 peace deal, was voted into office and modified the rules of the game in order for small farmers to participate in the business, through cooperatives. Another of the advantages of these improved seeds, besides their resistance to drought and heavy rains, is their high yields. FAO estimates that productivity has increased by 40 percent in the case of beans and 30 percent in the case of corn, which has boosted the food and nutritional security of the poorest families. “We produce more, and we earn a bit more income,” said Ivania Siliézar, 55, who produces an improved variety of bean in the village of El Amate in the department of San Miguel, 135 km east of San Salvador. Siliézar told IPS that she took the time to count how many bean pods one single plant produces: “More than 35 pods; that’s why the yield is so high,” she said proudly. The variety of bean grown by her and 40 other members of the Fuentes y Palmeras cooperative is called chaparrastique, and was also developed by the CENTA technicians. The name comes from the volcano at whose feet this and six other cooperatives grow the bean, which they sell in local markets, as well as to the PAF. Siliézar grows her crops on her farm that is just over three hectares in size, and in the last harvest of the year, she picked 1,250 kg of beans, a very high yield. Similar excellent results were obtained by all 255 members of the seven cooperatives, who founded a company, Productores y Comercializadores Agrícolas de Oriente SA (Procomao), and have managed to mechanise their production with the installation of a plant that has processing equipment such as driers. The plant was built with an investment of 203,000 dollars, financed by Spanish development aid and support from FAO, the International Fund for Agricultural Development (IFAD), the San Miguel city government, and the Ministry of Agriculture and Stockbreeding. It has the capacity to process three tons of beans per hour. Cooperatives grouping another 700 families from the departments of San Miguel and Usulután also set up three similar companies. 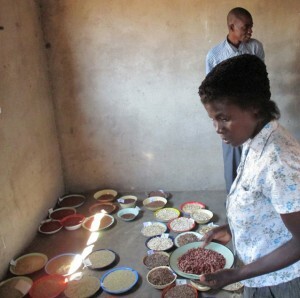 “We have had pests, but thanks to God and the quality of the seeds, here is our harvest,” Siliézar said happily. When the climate summit opened in Paris on Monday, the mood was overwhelmingly pessimistic — largely about the current state of the global environment. Secretary-General Ban Ki-moon set the tone when he warned that the impacts of climate change are growing. “Three out of four humanitarian disasters are now climate-related. Economic losses have increased by more than half over the past decade. And ecosystems, and food and water supplies are under increasing pressure,” he said. The hardest hit are the poor and vulnerable – including small farmers, fishing communities and indigenous peoples, he declared. He singled out the most vulnerable to include Small Island Developing States (SIDS), the Least Developed Countries (LDCs) and most African nations. US President Barack Obama was equally pessimistic. But still held out a ray of hope. He told the two-week long meeting, which continues through December 11, that he saw the effects of climate change firsthand in the northernmost state in the US, namely Alaska, where the sea is already swallowing villages and eroding shorelines; where permafrost thaws and the tundra burns; where glaciers are melting at a pace unprecedented in modern times. “And it was a preview of one possible future — a glimpse of our children’s fate if the climate keeps changing faster than our efforts to address it. Submerged countries. Abandoned cities. Fields that no longer grow. The meeting, officially designated the Conference of Parties (COP21), is being attended by more than 150 world leaders, and host of investors, business leaders, and mayors. They are expected to announce a range of initiatives, and possibly adopt a new international treaty to protect the global environment. Ban said a new, universal and meaningful climate agreement must contain strong provisions for all countries to strengthen their resilience. And it must provide sufficient and timely support for those countries that need it. Solutions are available, he said, singling out the Caribbean Catastrophe Risk Insurance Facility and the African Risk Capacity. Other initiatives with significant potential include the G7 InsuResilience Initiative, the CREWS early warning system initiative, the Global Resilience partnership, and Partners for Resilience, he added. Striking a positive note, Obama told delegates the global economy grew last year while global carbon emissions from burning fossil fuels stayed flat. And what this means can’t be overstated. Earlier this month in Dubai, after years of delay, the world agreed to work together to cut the super-pollutants known as HFCs. That’s progress, he said. Already, prior to Paris, more than 180 countries representing nearly 95 percent of global emissions have put forward their own climate targets. That is progress, Obama added. “For our part, America is on track to reach the emissions targets that I set six years ago in Copenhagen — we will reduce our carbon emissions in the range of 17 percent below 2005 levels by 2020. And that’s why, last year, I set a new target: America will reduce our emissions 26 to 28 percent below 2005 levels within 10 years from now,” he declared. Addressing the summit, the Director-General of the Food and Agriculture Organisation (FAO) José Graziano Da Silva appealed to world leaders to show courage and resilience by opting for changes that promote a safer, fairer and more inclusive world. 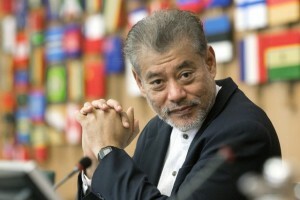 “There will be no peace without sustainable development and there will never be sustainable development while people continue to be left behind and while people are suffering from extreme poverty and hunger,” he said, adding that “we must demonstrate that we are not afraid” of promoting the changes needed to achieve this. Climate change “affects all of us, but especially the poorest and hungry people,” Graziano da Silva said, underscoring how smallholders and family farmers are “in the front line”. The most vulnerable must be helped to adapt to climate change, he added, stressing that in relation to the agricultural sectors, this requires environmentally sound initiatives that must go hand-in-hand with mitigating climate change impacts. Droughts, floods, storms and other disasters triggered by climate change have risen in frequency and severity over the last three decades. A recent FAO study shows that in developing countries, some 25 percent of the negative economic impact of these disasters is borne by the crop, livestock, fisheries and forestry sectors alone. He said the damage to rising seas and increasing typhoons is the present and it’s tearing apart the lives of some of the poorest and most vulnerable people on the planet. Singh also said leaders have now thrown themselves a gauntlet to address the current and devastating impact of climate change over the next two weeks. The same rich countries speaking up for the world’s most vulnerable now urgently need to match their words with action – and what they have put on the table so far is not anywhere near their fair share of that action. The report, A Profile of Child Marriage in Africa launched on 26 Nov at the first African Girls’ Summit on Ending Child Marriage in Africa, exposes current rates of child marriage in the continent and around the world. Globally, more than 700 million women and girls were married before their 18th birthday. Within this population, 17 percent live in Africa. “The sheer number of girls affected – and what this means in terms of lost childhoods and shattered futures – underline the urgency of banning the practice of child marriage once and for all,” said UNICEF Executive Director Anthony Lake at the launch of the report. Though child marriage rates have been declining, UNICEF noted that slow progress and rapid population growth in the African continent will put millions more girls at risk of child marriage. Without action, the number of child brides is projected to increase from 125 million to 310 million in Africa by 2050, surpassing South Asia’s rate of women aged 20 to 24 who were married as children. This will also constitute almost half of all child brides in the world. Nigeria is currently home to the largest number of child brides in Africa, with 23 million girls and women who were married in childhood. UNICEF also noted that high levels of child marriage are especially prevalent among rural, poor communities. In Guinea, child marriage rates are more than two times higher in rural areas than in urban areas, and three times higher among poorest households than among the richest. “The data is also clear that ending child marriage requires a much sharper focus on reaching the poorest and most marginalized girls – those in greatest need and at greatest risk,” said Lake. Participants also underscored other effects of child marriage, including maternal mortality and impeded access to education. UNICEF and AU called for accelerated progress, warning that only doubling the rate of reduction will not be enough to reduce the number of child brides in Africa. “Through greater awareness, teamed with a collaborative approach, the crippling effects of child marriage can be eradicated,” Zuma remarked. In May 2015, AU launched a continent-wide campaign to ‘End Child Marriage’. It included an action plan to reduce child marriage rates by increasing girls’ access to birth registration, education and reproductive health services as well as strengthening and enforcing policies protecting girls. “[Girls’] lives, and the futures of their communities, are at stake,” Lake warned. “Each child bride is an individual tragedy. An increase in their number is intolerable,” he concluded. The globally-adopted Sustainable Development Goals (SDGs) commits member States to numerous targets including the elimination of all harmful practices such as child, early and forced marriages. This story was sourced through the Voices2Paris UNDP storytelling contest on climate change and developed thanks to Megan Darby and Climate Home. Climate change impacts are already upon us. Sea levels are rising, glaciers and ice are melting. People in poor countries are struggling to cope and adapt. Even developed countries are facing adverse consequences, taxing their own adaptive capacities to increased flooding, drought and fires. We cannot afford to wait. Climate change is severely compromising development prospects. Failure to act effectively could significantly reduce the size of the world economy by mid-century despite continuing population growth. Addressing climate change will be costly, but not as costly as inaction. We have waited too long to take serious action, and the delay — e.g. the slow pace at which carbon-based energy is being replaced by renewable energy — has been costly in terms of adverse impacts. To address climate change, the international community needs to make simultaneous progress on inclusive sustainable development and climate change. This is the only ethically defensible and politically feasible approach. In the near term, for low carbon development and for developing countries to meet their people’s basic energy needs, renewable energy generation will need to be subsidized. Effectively addressing climate change and development will require a big investment push, particularly for renewable energy, with a strong public sector role, supported by international financial and technology transfers. Public investments need to be “front-loaded” to shape developing countries’ long-term energy infrastructure and development. As the most vulnerable are already suffering the impacts of climate change, there is an urgent need for developed country governments to greatly increase, fast-track and front-load financial and technology support for adaptation measures. Developing countries do not see sufficient evidence that developed countries are willing to bear a fair share of responsibility for adaptation and even mitigation despite their far greater contemporary and historical contribution to the climate change problem. Developing countries have long resisted taking on quantified emission targets, insisting on the Kyoto Protocol distinction between Annex 1 (developed) and other countries. Nevertheless, powerful developed countries have successfully pressurized developing countries to do so before the forthcoming Paris Conference of Parties (CoP). Nevertheless, from a climate justice perspective, most developing countries have made significant enough voluntary commitments to mitigate climate change. However, commitments by developed countries have fallen far short, and which are simply not enough to keep the average global temperature rise below two degrees Celsius. Yet, developing country actions have not been matched by efforts from Annex 1 countries to provide promised financial and technological support. Some developing countries, such as China, have not only implemented domestic policies to slow their emissions growth in the coming years, but have invested heavily in renewable energy and other low-carbon energy sources. These initiatives have accelerated the decline in renewable energy costs in recent years, but instead of being encouraged, some developed countries have erected non-tariff barriers to their exports, thus effectively slowing down the switch to renewable energy. However, rather than rely on market forces and the profit motive to address a clear market failure, adequate public finance for a major ‘front-loaded’ public investment push to induce private investment – rather than carbon markets and private finance – can rise to the climate challenge. Renewable energy is not affordable to most in poor countries, so there is little incentive for investment by the private sector. Hence, international transfers are needed for some public investment in key infrastructure and to provide incentives for private investment. Feed-in tariffs offering guaranteed prices to renewable power generators have worked well in Europe and elsewhere. In developed countries, consumers effectively pay for this subsidy, but in developing countries, that is less feasible. Thus, international financial transfers for feed-in tariff programs could quickly induce renewable energy investments in developing countries. Cost reduction will come with increased scale, while greater ability to pay will come with increased incomes. In time, the subsidies become unnecessary. · International technology cooperation, knowledge-sharing and adequate finance for climate change adaptation and mitigation. · A global program of support for renewable energy in developing countries, including support for feed-in tariffs, to enable poor developing countries to ‘leapfrog’ the fossil-fuel energy stage of economic development. · A global program of support to reduce emissions and sequestration capacity due to deforestation and forest degradation, notably through sustainable forestry and by rewarding forest-dependent communities for sustainable forest management. · An adequately funded program of support for rapid action for urgent adaptation measures in vulnerable developing countries. There is broad consensus on all these areas, and progress on such a global program of cooperation is eminently feasible. Experience has shown and will continue to show what works best and what actual costs are, proving that stronger actions are possible and affordable. Cooperative action between developed and developing countries will, in turn, rebuild trust on the road to Paris and beyond.